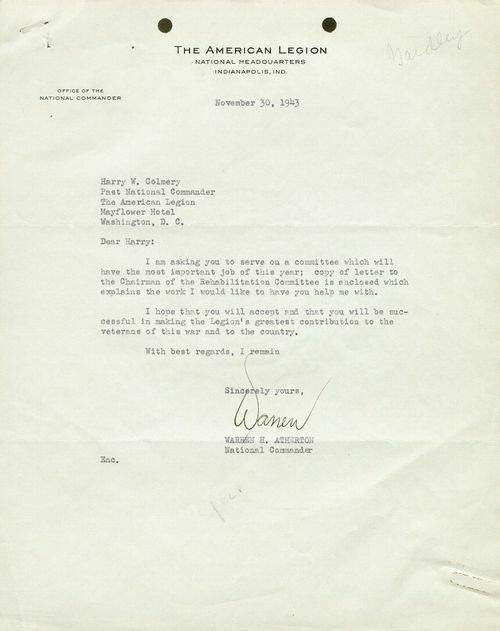 Warren H. Atherton, National Commander of the American Legion, wrote to ask Harry Colmery, a past National Commander of the American Legion, to serve on a committee to look at veterans benefits following the end of World War II. This committee ultimately drafted and advocated for the adoption of the G. I. Bill of Rights. Colmery lived in Topeka, Kansas, but he also had a suite at the Mayflower Hotel in Washington, D. C.
Collections - Manuscript - Colmery, Harry W.